See the reverse of the strip with an 18" ruler for size comparison. 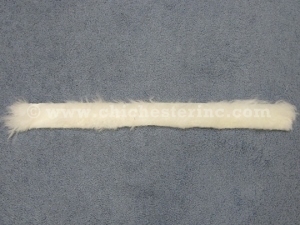 Made from genuine cashmere goat plates, these fur strips are strong, light and soft, and measure 2" by 23" with 2" long hair. They are ideal as trim for winter garments and fashion accessories. Goats are not subject to CITES or USFWS controls.